This highly versatile Galvanized Steel Tub with metal handles, sets this galvanized tub apart and adds class wherever you use it. 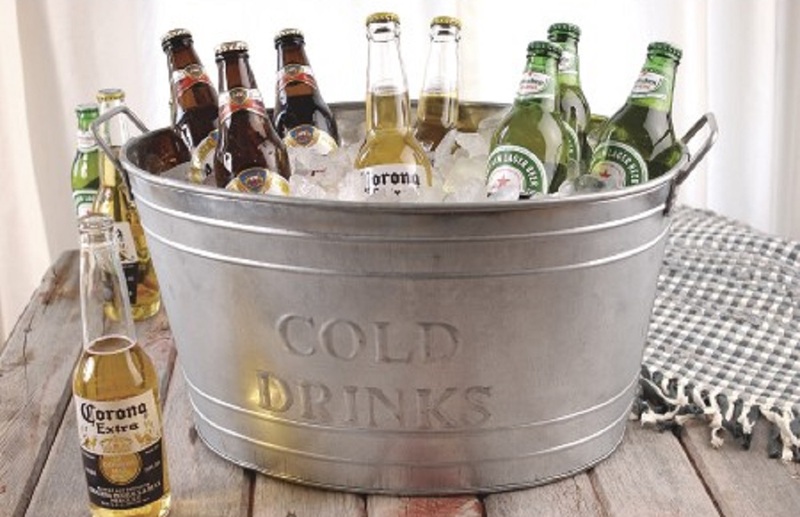 Great for use as a Galvanized Beverage Tub cooler for weddings or large gatherings for parties. It is the perfect sized ice tub for your next party or event measuring 18x12x10 inches. Fill it with ice and beverages and let the party begin. You can’t beat the classy look of this metal tub when used outdoors as a planter container or vegetable garden. Use to store and organize magazines or books or simply display as décor anywhere around the home, office or outdoors. 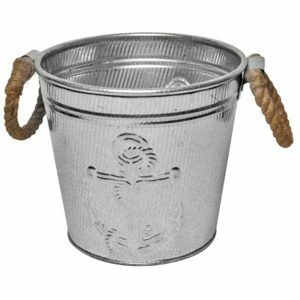 This metal galvanized steel tub is tall enough to hold your drinks and ice but small enough to be easily portable. Measuring 18x12x10 inches, it’s the perfect size for use as a beverage tub or outdoor galvanized tub planter. The oval shape enables it to hold more of your party drink beverages and the metal handles make it portable. 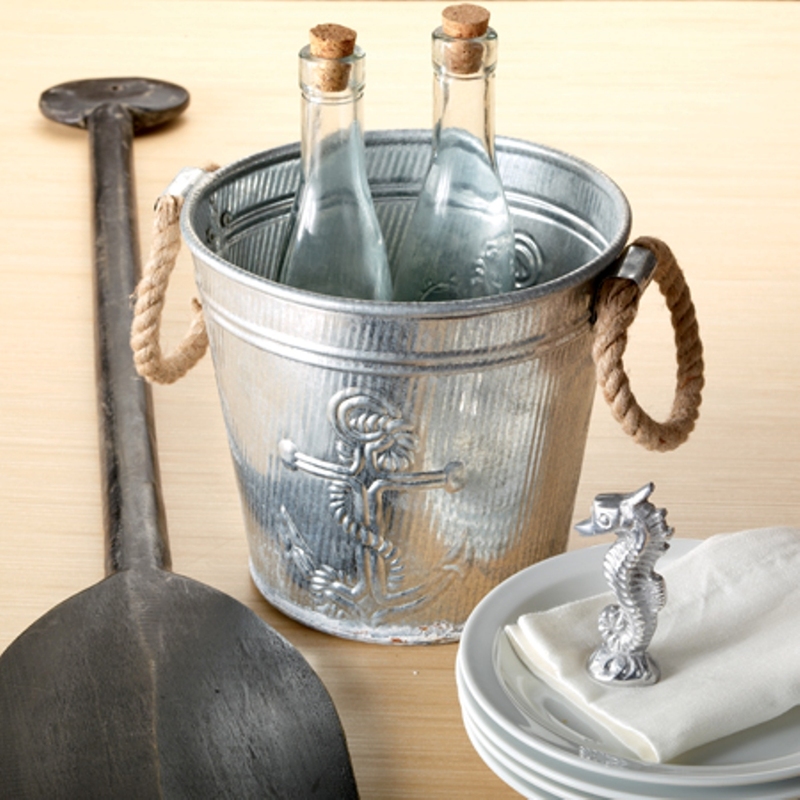 The designs on this decorative galvanized tub makes it a perfect addition to your rustic galvanized bucket décor. When not in use as a cooler, this tub makes a beautiful galvanized garden tub for vegetable plants or flowers. 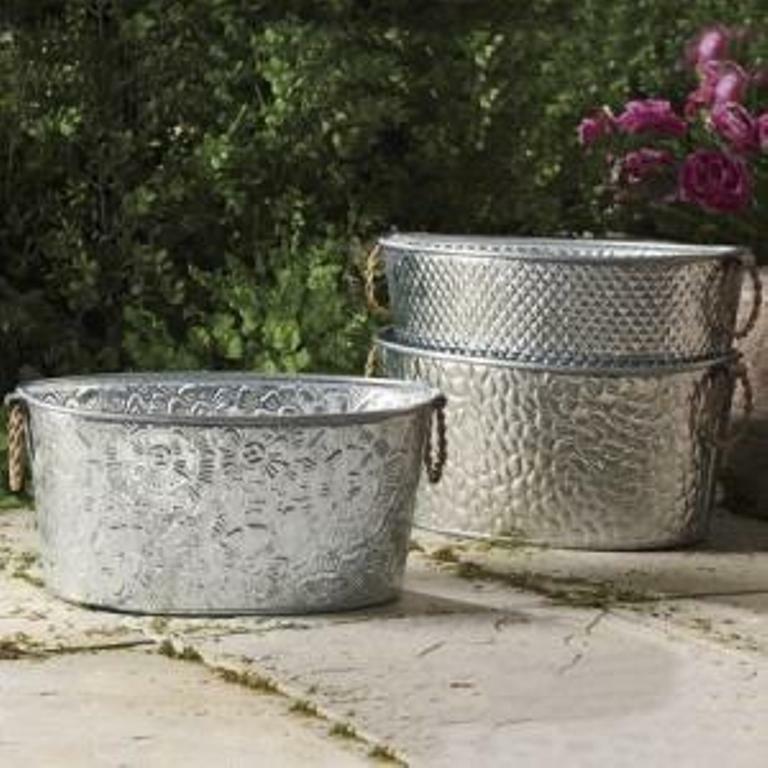 This highly versatile Galvanized Steel Tub with its 3 stylish designs and metal handles, sets this galvanized tub apart and adds class wherever you use it. 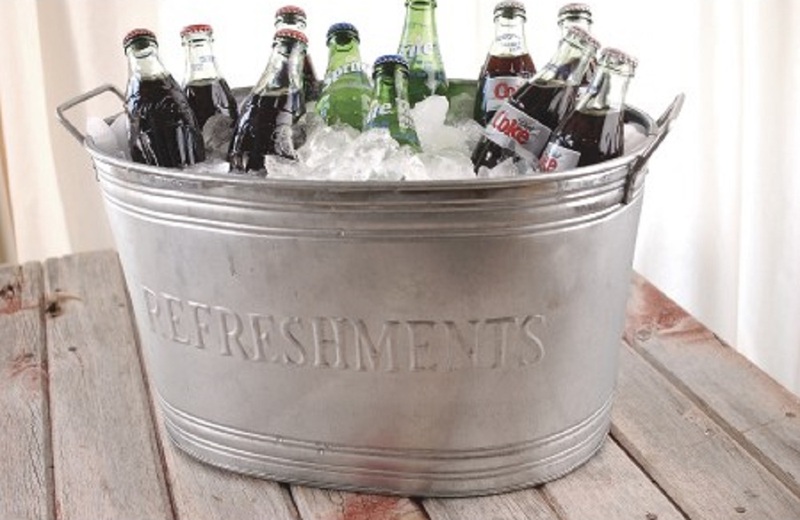 Great for use as a Galvanized Beverage Tub cooler for weddings or large gatherings for parties. It is the perfect sized ice bucket for your next party or event measuring 15×10.5×7″. Fill it with ice and beverages and let the party begin. These stylish tubs come in 3 patterns – floral, diamond and stone. ONE randomly selected tub per order. Measuring 15×10.5×7 inches, they are the perfect size for use as a beverage tub for drinks and ice. 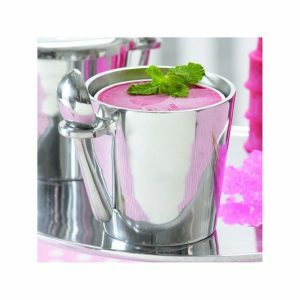 The elegant designs on this beverage tub set it apart and add a touch of class to any event or décor. 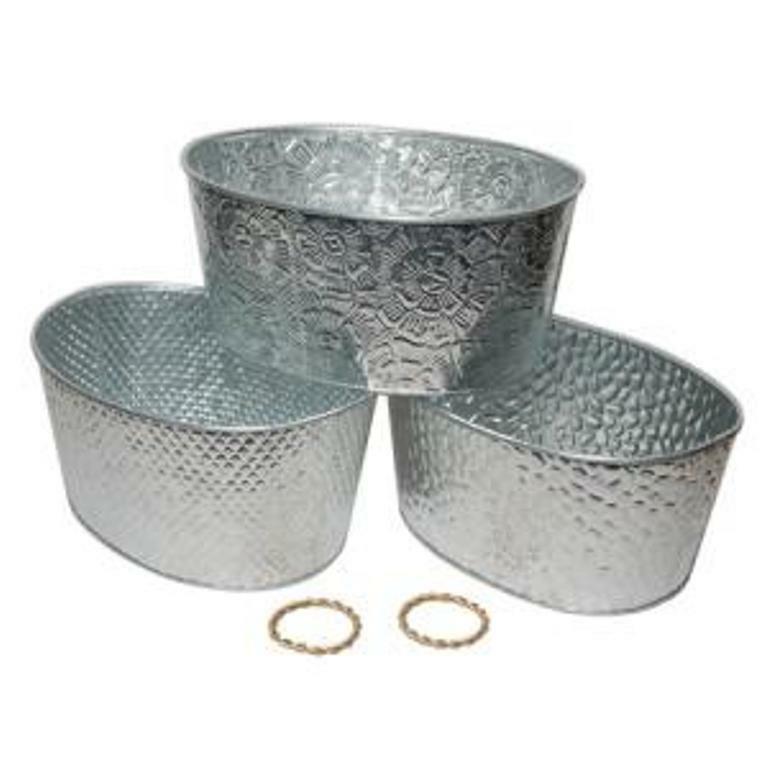 When not in use as a cooler, this tub makes a beautiful galvanized planter bucket for vegetable plants or flowers. The Fleur De Lis Bucket is a classic and practical way to celebrate your next outdoor gathering. Made of durable galvanized steel with twisted metal handles, fill it with ice and beverages and let the party begin. It is the perfect size for your next party or event – it measures 8x7x7″. The bucket is decorated with a Fleur De Lis ribbed design and doubles as a beautiful planter or flower holder. Great addition to your Galvanized Decor collection! Versatile Medium Metal Bucket is perfect for Weddings, Party Drinks, Plants & Flowers and Décor. Buckets are made of durable, galvanized steel with twisted metal handles and measures 8x7x7 inches. Rustic Galvanized bucket is perfect for showcasing your plants and flowers a s a metal pail planter. 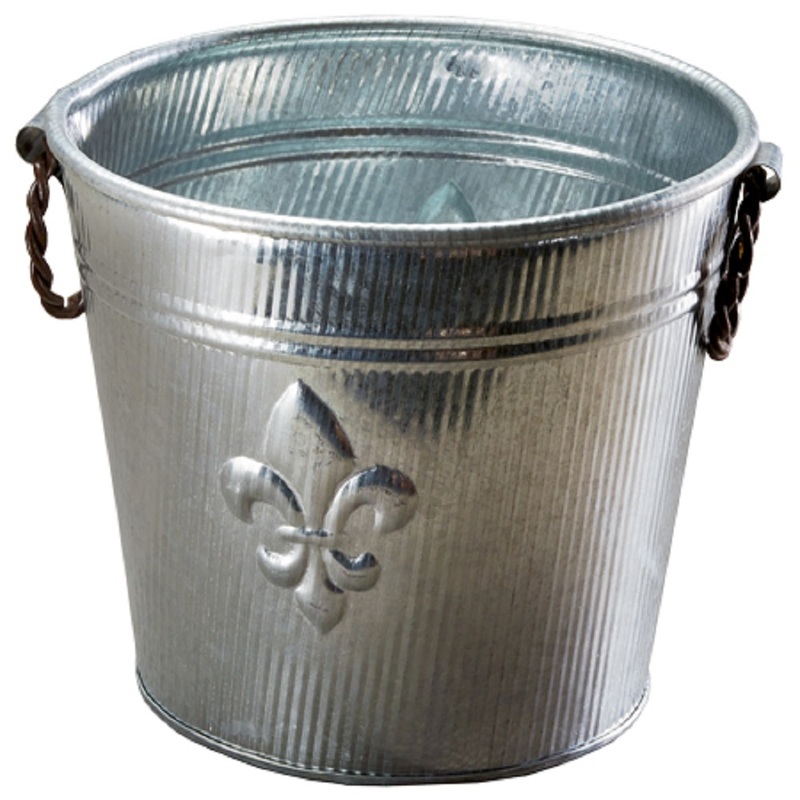 Look no further than this Fleur De Lis ribbed design bucket when adding to your rustic farmhouse décor! This versatile, medium size, tall Galvanized Tin Bucket can serve many purposes for you. It can hold your party drinks, display your beautiful plants and flowers, or simply be used as a beautiful addition to your rustic farmhouse decor. Made of durable galvanized steel with easy to carry jute rope handles, this metal bucket is a classic and practical way to celebrate your next outdoor gathering. It is the perfect size for your next party or event – it measures 12x10x6 inches. Great addition to your Galvanized Decor collection! 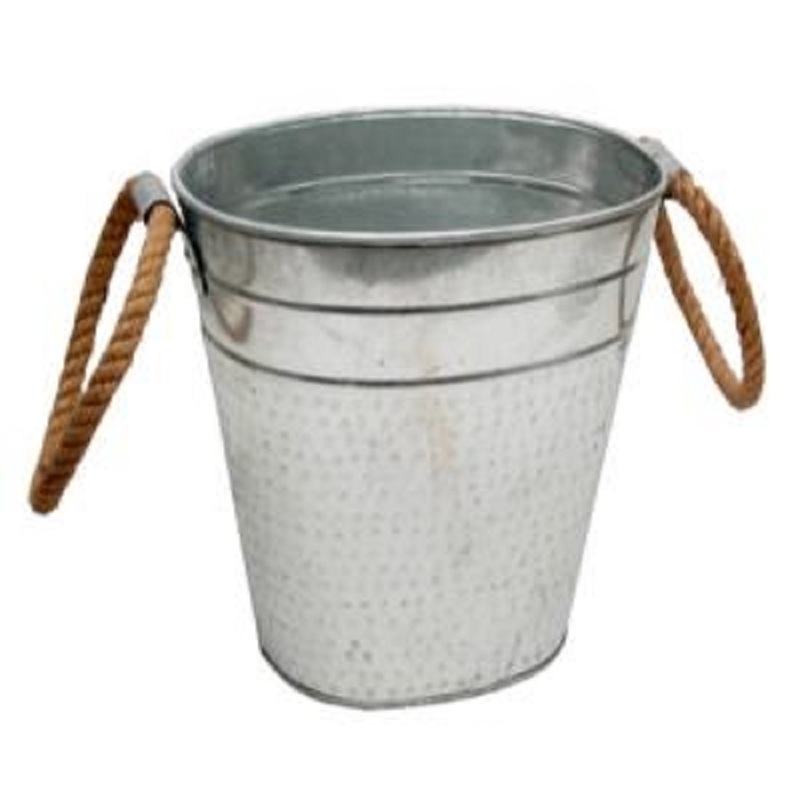 Buckets are made of durable, galvanized steel with jute rope handles and measures 12x10x6 inches. 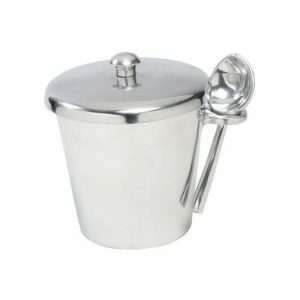 Metal Ice Bucket functions great for outdoor parties and weddings as your champagne bucket or wine chiller. Rustic Galvanized bucket is perfect for showcasing your plants and flowers as a metal pail planter. 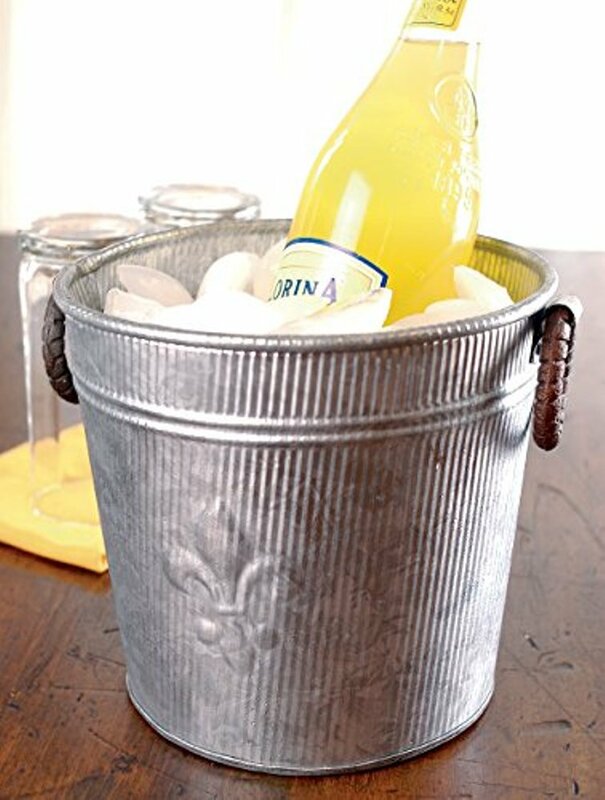 Look no furtherthan this Galvanized Steel Bucket when adding to your rustic farmhouse décor! The Copper Leaf Oblong Party Tub is a classic and practical way to celebrate your next outdoor gathering. This huge party tub is made of durable copper metal with a leaf pattern relief and copper handles. Fill it with ice and beverages and let the party begin. It is the perfect over sized ice display for your next party or event measuring 21x12x8″. Copper Tub doubles as a beautiful planter or flower holder. 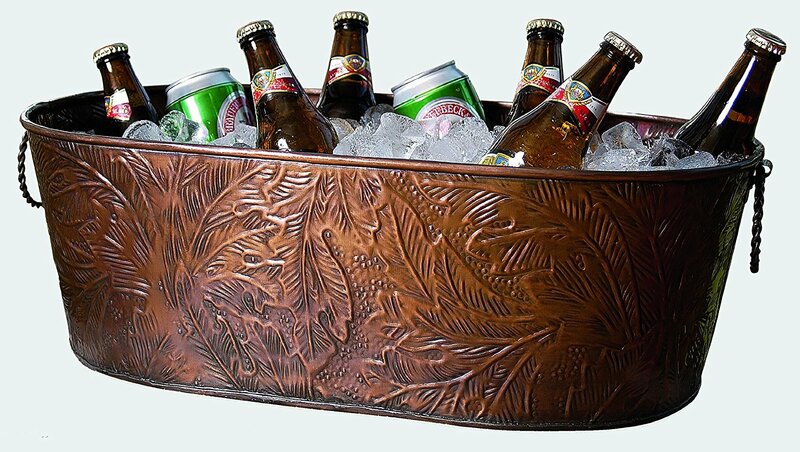 When it comes to ice tubs for parties or weddings, this copper beverage tub is all you need. It’s large size, 21x12x8, will accommodate all your drinks and ice in this cooler bucket, chiller tub. This durable steel tub has a beautiful copper finish with a leaf pattern relief that adds an extra touch of class to every party or event that you host. The large Oval Tub shape enables it to hold more of your party drink beverages and the bronze metal handles make it easy to carry in order to better serve your guests. The large size of this beverage tub also makes it an ideal ice bucket for restaurants and bars. When not in use as an ice tub or drink cooler, this tub can be used as a beautiful planter bucket or flower holder. Everyone loves ice cream…until it starts to melt. Now you can savor each bite without feeling rushed. 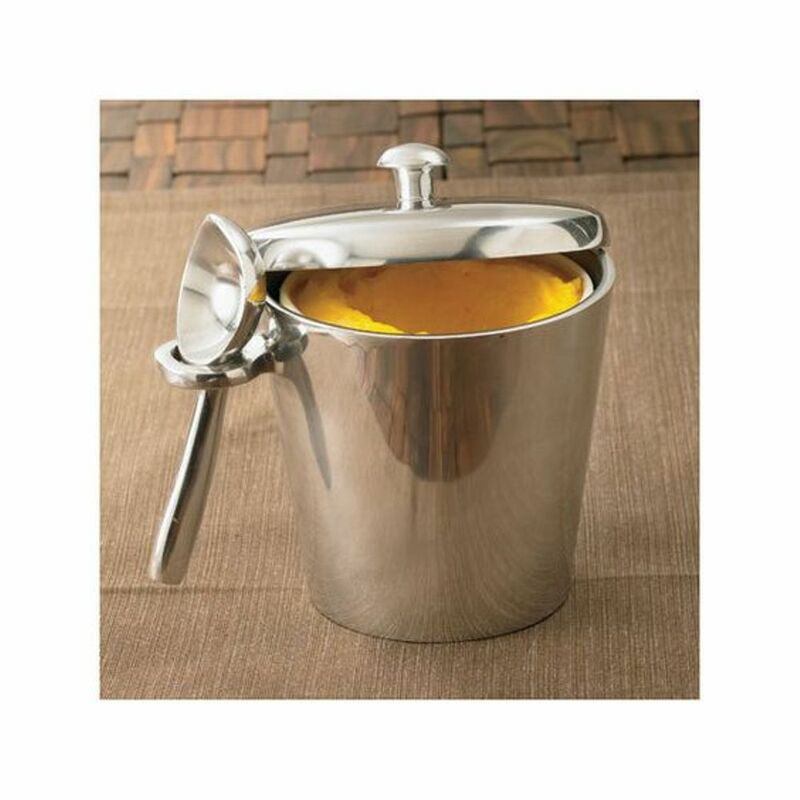 Simply place a pint or carton of ice cream into this metal alloy container for a long-lasting chilled treat. This Ice Cream Maker companion perfectly stores your homemade ice cream, sorbet, yogurt, yonanas and other frozen treats, keeping them cold while being served. The Ice Cream Tub measures 4.25 by 4.25 inches and holds approximately a pint of ice cream to make entertaining effortless and attractive. Forged from sand cast aluminum, the design is lidded and includes a scoop easily held by the side loop. The durable and lustrous cast aluminum holds a chill to keep ice cream fresh longer. Frozen Dessert container includes a matching lid with knob handle. Keeps your ice cream nice and cool. 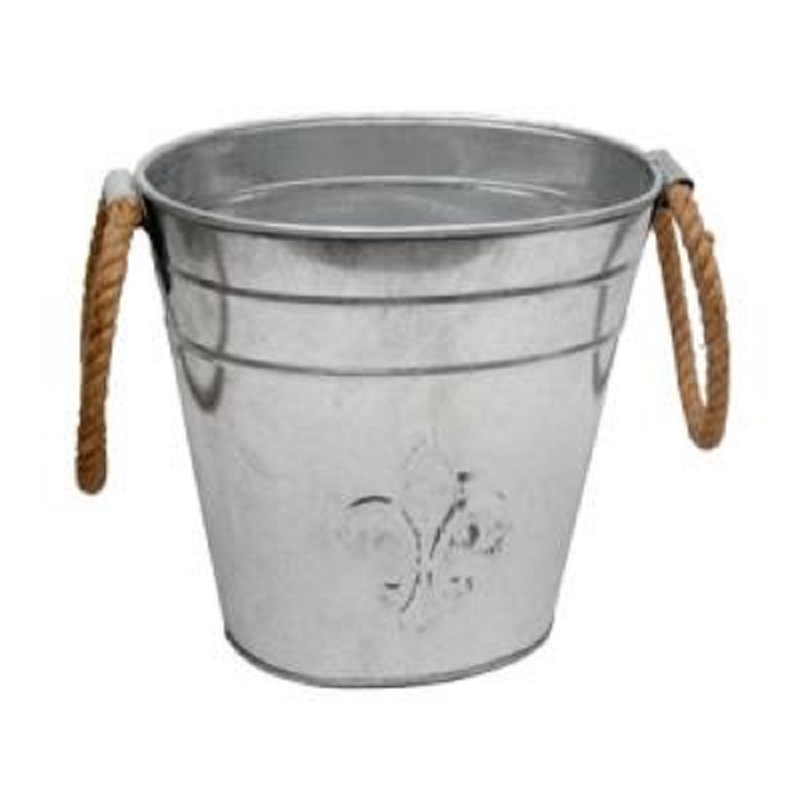 The Fleur De Lis Bucket is a classic and practical way to celebrate your next outdoor gathering. 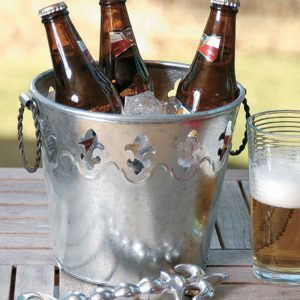 Made of durable galvanized steel with twisted metal handles, fill it with ice and beverages and let the party begin. It is the perfect size for your next party or event – it measures 8x7x7 inches. The bucket is decorated with a Fleur De Lis cut out design and doubles as a beautiful planter or flower holder. Great addition to your Galvanized Decor collection! 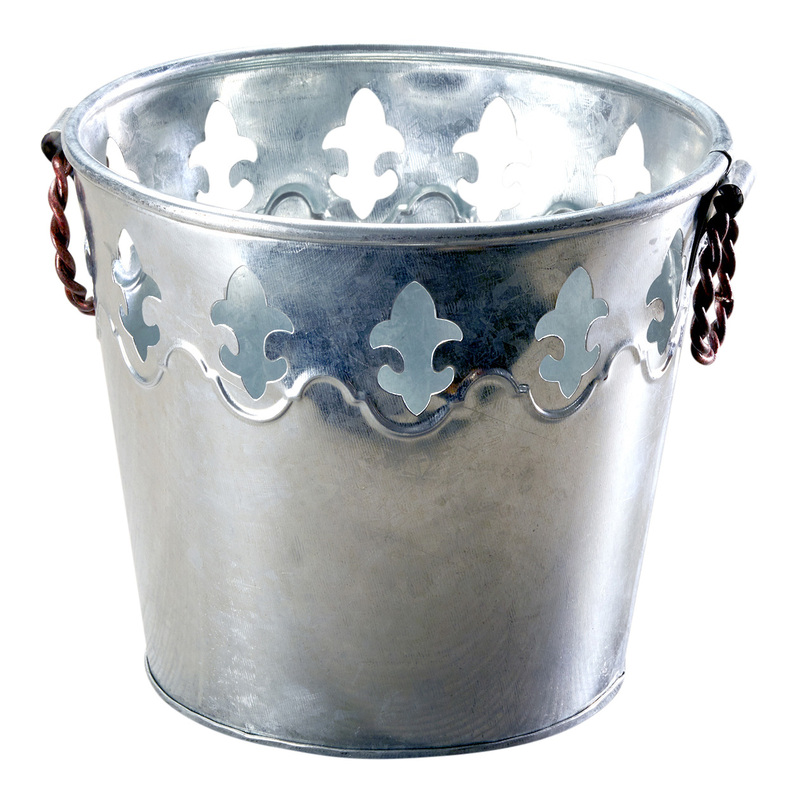 Look no further than this Fleur De Lis cut out design bucket when adding to your rustic farmhouse décor!